Our production methods set us apart from most other commercial cider makers. In a time when so much emphasis is put on fast, cheap production we have focused on the traditional methods that have been finely honed by cider makers for generations. 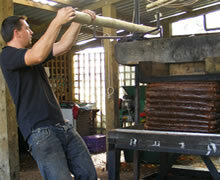 In doing so we hope to re-affirm cider and perry as the highly regarded drinks that they once were. We believe that every apple has its place in cider and that it is down to the skill of the cider maker to find that place, alongside other fruit who's characteristics will complement it. So we harvest cider, desert and culinary fruit from our orchards in quantities that will give our cider both balance and depth of flavour. We only use apples from unsprayed orchards which are harvested by hand with the help of the friends of Prior's Tipple. Many of our orchards consist of extremely old, large standard type trees, some dating back to Victorian times. In contrast to the modern day, intensive bush orchard they provide excellent wildlife habitats. By harvesting this fruit we are making use of otherwise unwanted apples. 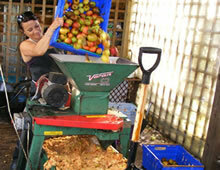 Having collected the fruit it is washed and milled. 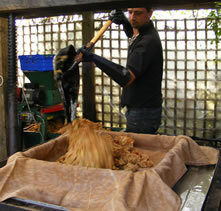 The pulp or pomace can then be loaded into our screw press. The iron work on the press is over a hundred years old and the design itself replicates presses used for many years before. 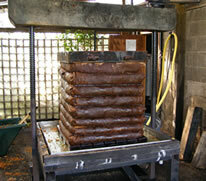 The pulp is built up into what cider makers call a cheese. This consists of multiple layers, each wrapped in a cheese cloth. The two screws are then tightened to lower the beam onto the cheese and the juice flows into the collection trough below. When the screws can no longer be turned by hand, they are tightened by using 6ft then 8ft poles squeezing every last drop from the pulp. We are unusual in adding absolulely nothing to the juice, no sulphites, artificial yeasts or other chemicals, just the pure juice goes into the 1000 litre vats and the magic begins. The wild yeast that exists naturally on the skins of the fruit begins the fermentation process, this is when the sugars are converted into alcohol. Eventually the wild yeasts that live on our equipment and in the barn itself will take over, giving every batch a unique flavour. 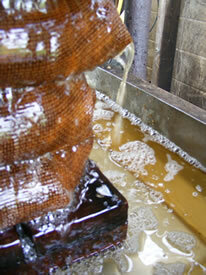 Although the cider is drinkable some time in late spring, we allow it to develop for up to 2 years. Around June or July on the first year a secondary fermentation takes place. This knocks all the rough edges off the flavour of the cider, softening the acidity and turning tannins into spicy notes. The finished cider is then blended with other vats in order to get all the characteristics we look for into each product. It will then be either sent away to be bottled and packaged, or decanted into kegs for our draught products. Due to year on year changes in weather, fruit availability and our decision to use wild yeasts rather than artificial ones, our products will vary from batch to batch. We feel that this makes our ciders and perries interesting and sets them apart from other mass-produced drinks. We do however believe we have consistency in quality and we hope that you agree.